← A pause or not a pause, that is the question. Is Earth’s temperature about to soar? Yet for years one of the favorite claims of those who deny the danger of global warming has been “No global warming since [insert start time here] !! !” They base the statement on the observed data of earth’s surface temperature or its atmospheric temperature. Then they claim that such a “pause” or “hiatus” in temperature increase disproves, in one fell swoop, everything about man-made climate change. Rahmstorf’s post is based on a mathematical technique known as “change point analysis” (with the kind assistance of Niamh Cahill, School of Mathematical Sciences, University College Dublin) applied to data from GISS (NASA’s Goddary Institute for Space Studies). The result is that the most recent change point (the most recent change in the trend) which is supported by the data happened back in 1970, nearly 45 years ago. As for a change in the trend more recently than that (which is the basis of claims about a “pause”), there’s just no evidence that passes muster. With so many data sets to choose from, sometimes those who deny the danger of global warming but don’t like the result they get from one data set will just use another instead, whichever gives the result they want. Then again, some of them might accuse Rahmstorf, in his blog post, of choosing the NASA GISS data because it was most favorable to his case; I don’t believe that’s true, not at all. We can forestall such criticism by determining the result one gets from different choices and compare them. In fact, it’s worth doing for its own sake. Just eye balling the chart, it looks like things have leveled off since about 2001. OK, only kidding. Getting back to your bet in 2008, GISS data had showed a warming trend of 0.0182 C/yr from 1975 through 2007. You then calculated a flat average value for the 2001 through 2007 period for future comparison. The GISS data have been adjusted since the original post, the values are all a bit higher. The trend from 1975 through 2007 is now slightly higher at 0.0191 C/yr, and the trend since 2001 is almost flat at 0.0031 C/yr. As you demonstrate, no proof of a pause or flattening, but some evidence of one perhaps. [Response: Given that we know, for certain, that natural variations will never stop and easily lead to what you’ve seen, I’d say that evidence is weak. Far too weak. It just doesn’t pass muster. The Problem is, that most of skeptic do not realise, that internal fluctuation will aways lead to “Pause” “cooling” “Hiatus” or some named else. So we can run out some sort of it (like Rahmstorf and Tamio does). So we can take another approaches, but is missed here in the Blog. Everyone at self can do a simple test, to figure out, how internal fluctuations (we have to like its only random) alter shorter Trends. We take real messurced variance, written 10 or 20 or 50 Series of random noise in the magnitude of the messurced variance. First given a linear Trend (like 0.1K/Decade or 0.2K/Decade) and draw noise on it. Suprise Suprise, internal (random) fluctuations can lead to “no warming” to timescales obove 10 Year. 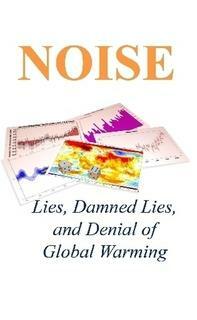 But, internal fluctuations are directly like random noise, so there can be “no warming” large above 10 Years. This is a strong argument, why models even not wrong in their model physics (often claimed by some “skeptics”) but more to Imput-Forcing (also solar-Forcing). But this is important for the descrepancy between Observation and Model, ENSO anyway is only able to explain “Pause” or whatever. Its easy to see, that ENSO modulates only the form of increase, but less the increase atself. Oh its getting longer that i want to, so that it. Hey Grant, but if you connect just the warmest years from 1998 to 2014, it looks almost flat… OK, I’m also just kidding! Excellent post – great you’ve gone to the trouble of working this out for all the different data sets! It’s kind of funny (and sad) that the whole “evidence” for a pause is completely dependent on the extraordinarily hot 1998. Without that point, it’s really hard to even visually argue for a pause. 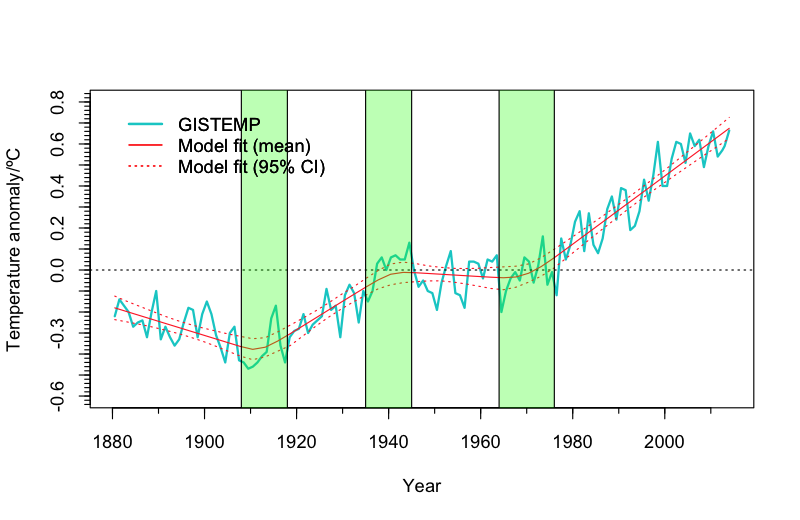 30 years of GISTEMP data up to 1997, a break where 1998 would be, and then the remaining data to date. The trend lines aren’t very different at all, but again the second one will have no meaningful information to be gleaned about a temperature deviation because the noise overwhelms the signal on that timescale. Still, the best fit is a line that doesn’t deviate much from the original which preceded it. If someone wanted to show a definitive pause/hiatus, then the second line would have to look very different. Heck, in order to make a statistically significant change over such a short period of time and overcome the noise, there would have to be a very hefty drop in temperatures. I think we would have noticed it happening over the last 16 years, even with the notoriously uncalibrated eye-crometers of the denialists. 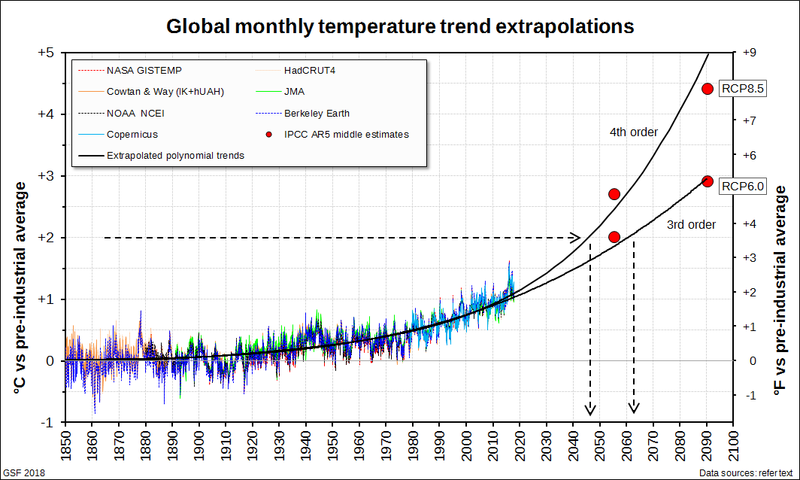 I don’t have the math to work it out, but suspect temperatures over the years 1998-present would have had to fall at a comparable rate to the warming over the previous 30 years to sink their way out of the noise and into the territory of a clear and unambiguous signal. It seems a world with a definitive “pause” in warming would need to be very different from the world in which we find ourselves. Denialists have for years made a big song and dance about how there is no “statistically significant” warming for X years where X is their favorite number. Whenever I point out that there is also no statistically significant slowdown in the rate of global warming they put on a playing dumb act. They don’t like it when they’re hoist by their own petard. And to your point, they also only focus on the lower bounds of uncertainty, poo poo the the statistically most likely figure, and act as though the highest uncertainty figure wasn’t even part of the calculation. Total intellectual dishonesty, which wouldn’t even be expected of those ignorant of even a sliver of the science. Right, and how often have you seen the so called failure of James Hansen’s 1988 (26 year old) projections used as a supposed final nail in the warmist coffin? Just try and explain the nuances of actual vs projected emissions, scenarios boundaries, climate sensitivity uncertainties, and the 26 year old state of climate modeling vs what they know now. All deniers that “know”, is that Hansen was wrong once, and he is the sole arbiter of all climate science, so by that transitive property, all climate science is bunk. 1) Could you elaborate on the remark “there’s no chance whatever of finding a “slowdown” that starts before 1990 or after 2008.” My guess is that you can’t find anything post-2008 because there are so few data points that the error bars on short trends are going to swamp any chance of significance (right?). Why is it obvious a priori that there isn’t going to be a change point pre-1990? 2) When I look at your first figure (the second figure in the post), I see some obvious clumping: for purposes of this analysis, it looks like GISS and CRUTEM4 are similar, UAH is off on its own, and everybody else is similar to each other. Is this revealing anything interesting about these datasets? I don’t get why one couldn’t conclude or conclude to have proven that a breach of trend did not occur. If 6 independent measurements of the size of a box with content showed it is not large enough to fit an elephant, can’t we state that we have conclusively proven an elephant is not residing in the box? [Response: Of course. But “slowdowns” come in all sizes, there might be one which simply isn’t big enough or long-lasting enough to have yet risen above the noise level. A clear, detailed analysis on why there hasn’t been a “pause” or even a slowdown in global surface temperature. Thanks for pointing that out. I corrected that wording on my blog post. I still get given the “now the world is cooling …” ploy. However excellent your argument, it understates the case because warming is all the heat coming into the system; while you only use data on atmospheric sensible heat. The full argument must include ocean warming, ice melt, and more latent heat in the atmosphere. Just the increase in latent heat in atmosphere means that the conventional weather databases UNDERSTATE the increase in the amount of heat in the atmosphere. The increase in relative humidity in the atmosphere over the time period likely represents more energy in the atmosphere than the increase in sensible heat. The increase in relative humidity is due to warmer surface sea temperatures allowing greater evaporation and warmer polar conditions causing less condensation. None of this is well tracked in the conventional weather databases. The warmer sea surface temperatures alone indicates an enormous increase in system heat that dwarfs the increase in heat of the atmosphere. Changes in Arctic Sea Ice suggest that there have been changes in deep water formation. From this, it is prudent to assume that the deep ocean is also warming. This is particularly true during the time period of interest. We look at sensible heat in the atmosphere, not because it is the best indicator of total heat in the system, but because it is the best data we have. An understatement of total global warming as a result of poor data perverts rational risk assessment, policy, and planning. The final GISS chart with the tramlines shows an increase of around 1.1 deg.C from 1970 to 2040. I wanted to see how this compares with IPCC AR5 future pathways; looking at Figure SPM7a (WG1 summary for policy makers, global average surface temperature change) at the top of page 21, that level of increase is in the lower half of the RCP2.6 range. Which is rising but doesn’t seem to be ‘soaring’ quite so much. Is it a dodgy comparison to make – are the datasets for NASA GISS and the RCPs not really comparable enough to be able to overlay one over the other? Visually, I think I can see a trend correlation, once the noise is taken out, in which CA drought drops slightly (PDSI increases) while global temperature drops, but around 1880 as temperature changes course upward, so does CA PDSI, but downward (increasing drought). The best argument I’ve found for the “no warming since (fill in the year)” is the satellite measured rise in sea level, which is much less noisy and therefore highly significant over shorter timespans. There is simply no way the sea level can rise over a timespan of a few years, absent a warming planet. This is an easy demonstration that what’s happening at the end of any noisy dataset will always be statistically insignificant, but that in no way implies that there’s no signal in the noise. FWIW, it would be interesting to structure the problem as a game of craps with the annual average being a throw of the dice and ask the question of what the odds are of throwing a higher number than 6 so many times in a row. Should we shoot Nathan Detroit? I think that the denial community, especially the politicians, have painted themselves into a closet, and now there is no room to retreat to. It is now time for them to come out of the closet, and join the reality based community. So, I’m not quite sure what you’ve shown here. Looks like a somewhat incomplete analysis, it needs FUTURE and PAST data! 1) UAH & RSS start in 1979 not 1970 (so that we have a smaller N problem for these two (N = 11 vs N = 20 for all other time series). 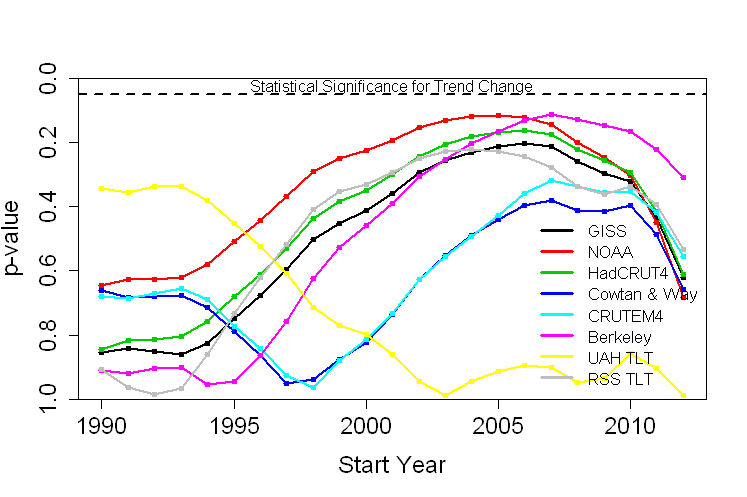 We also see that UAH and RSS are the two most divergent time series (? given that both are are the only two using MSU data). 2) The GISS change point trend analysis starts in 1880 and ends in 2014 (tentative for 2014), the trend line change points (p = 0.05 ?) are 1912, 1940 and 1970. Do I detect a trend? Don’t know, but let’s pretend, shall we? So what we now see is a pattern (no, not the 32, 28, … pattern). That pattern being the N/2 and/or small N problem, and I would suggest that we are currently in the middle (of a possible) small N and/or N/2 pattern. The current pattern is N = 16, and we can see from your 2nd figure, that both the start and end points tend towards large p values (N = 20 or 11 at the start and N = 3 at the end (assuming 2014 is the last annual point of the annual time series)). So, in essence your 2nd figure is a “snapshot” at N = 16. Now we have the HadCRUT4 (and C&W adjusted HadCRUT4), GISS and NCDC/NOAA all going back to 1880, a total of 4 time series with ~135 years of data each. Words like hold back, withhold and double blind come to mind here. Determine trend line change points from all 4 of these longer time series (The resulting patterns are what? Somewhat similar? Let’s assume so for the current discussion. ), then conduct the same analysis you have performed for each change point (e. g. GISS 1880 thru 1912 (1st baseline period) then add the period 1913 thru 1940, one year at a time, and plot p vs time, here I would suggest that at ~ the midpoint (or slightly afterwords, say between 1925 and 1930) p < 0.05, now do GISS 1912 thru 1940 (2nd baseline period) … (rinse and repeat), now do GISS 1940 thru 1970 (3rd baseline but with a 42 year period following) … (rinse and repeat)). Now, I would rather very kindly suggest that for 25 < N < 35 (very roughly speaking, as it depends on the actual series of change points and p value used), what currently looks like a downward ending trend (small N and/or N/2 problem) for N = 16 would continue upwards until the chosen p value was met and again descend close to p = 1 at the end point window (if, and a very big IF, anything like the current hiatus (IPCC AR5 uses that word like 53 times (Greg Laden even counted them for me)) period were to continue for another ~15 years). Things that I am suggesting, a more complete analysis would dictate the current p value to use when consideration of the start/end point of a time series may be somewhat close to a real or potential change point. I would do this exercise myself, but I don't have a PhD. in statistics, I am not an institutionally trained climate scientist and I don't have any peer reviewed publications in the field of climate science. However, whatever the outcome of such an analysis would show, I would think that that might make for a good peer reviewed journal publication. Future data is the gold standard, of course, but boy, is it hard to come by! That’s why sites like WUWT like to use ‘pasture’ data. Yes, because they don’t like to do field work. We could assume FUTURE data similar to the current ~16 year trendline + white noise (random or gaussian or whatever the pdf) out to say 2030. But that’s not really the main point, because we can test the longer time series that have PAST data and change point trend lines. Once one determines the change points (e. g. GISS has already been done), one can use that as a series of three baselines (each of the 1st I-1 leg segments is a baseline (or working backwards the last I-1 segments)). Now using the 1st baseline solve all N from the adjacent baseline time series. You will very likely get a run length of M < N that satisfies your p criteria (say p < 0.05), as M approaches N, p must approach 1 (for M = N-1 we have two points, the minimum required to establish any trend at all). So, one would expect an evolution of the p curves as 1 < M < N, I would then call those p curves partial p curves (between successive change points), and we are currently at M ~ 16 (and may not ever get to higher M as the next change point may not develop due to the selected p < 0.05 (or whatever) criteria. But that's not really the main point either, the main point is that if a change point trend line were to develop, the PAST data can illustrate this quite nicely. So, for example, chop off 1880-1895 (or on the next leg chop of 1927-1940, so on and so forth), compare that partial p curve for that era with the full p curve for 1880-1912 (or 1912-1940). Does the full p curve have a smaller p score than the partial p curve p score? I will for the moment assume so, unless shown otherwise for all legs from all 4 longer global SAT data sets. Change point trendline detection, thus becomes a somewhat trickier exercise for the start/end points of a time series (we only have half the information that we do for the middle of the time series, err trendline segments, but we also have the small N problem at either the beginning or end of the next trendline segment, M close to the lower limit and n – m close to the upper limit (lower case n/m used to denote partial trendline segment). My current, somewhat limited understanding, is that one would need to apply a higher p value than one would necessarily apply to the interior trendline segments (given a longer time series that does detect additional trendline segments (in the region of the shorter time series) where none existed originally for the shorter time series)). So, from that perspective, perhaps a p score of ~0.20 is necessary, and as we can see from the above, that condition appears to already be satisfied. Another rather longish post, perhaps even more confusion? If so, then perhaps someone else needs to explain this to you all. Everett, Pray, what useful information would such an analysis yield? It’s been around ~15 years, has a fairly nice GUI, several paper have been written up through 2014 using Joinpoint, and the most recent version is dated October 7, 2014, is free, has fairly good documentation and an example (or two) and a FAQ and etceteras, so this “should” serve my needs. N = full 2nd leg, 0 < n < N + 1, where we "could" carry out every n value of the 2nd leg. This could then be plotted for all n somewhat similar to the 2nd figure above (but with 31 curves for the 31 n values). I believe, that doing the above plot would show a general evolution of lower p values as one goes from n = 1 to n = N = 31. Now, with this information in hand, we can inform ourselves of what the lowest p score is for n = 17 versus n = N = 31. I believe that p(n = 17) will be greater than p(n = N = 31). This may be somewhat similar to the current change point leg (using 1998 as a 1st approximation change point). I believe this procedure could be extended to all legs of the four longest global SAT time series. Which would give us I = 12 ratios of p(n = 17) versus say p(29) (assuming 29 is the minimum number of years between any two change points). In closing, I'm also wondering (much idle speculation) about the whole range of 0 < p < 1, where there are likely limiting ranges (for a particular time series) where one gets no change points and at the other extreme every point becomes a change point. Again, Everett, what are you trying to show? I do not see how the Joinpoint model you cite is at all relevant to the dataset we are discussing here–for example, none of the data here are based on counts, so Poisson variability isn’t applicable. Poisson Variance button is grayed out for all except Type = Count and Type = Crude Rate. As to what I am trying to show … well it’s an attempt at … Raising … err … Lowering the Bar … and I will be playing the parts of … Honey Boo Boo … and … Cartman. So…technobabble, then? Probably not the best audience on which to try that. Which part of my very last statement is technobabble? Let me guess the “dishonest person” part. Please remember that you brought up the Poisson variability argument to begin with in the 1st place, while clearly not knowing squat about said software. If you think the last, err sentence is technobabble, then watch that episode of SP (or better yet read the script). Publish immediately. Have a nice life. Can’t even add or subtract, go figure. Thank you Tamino, I love reading your analysis. Great analysis, but I’m curious why you didn’t make the distinction (as most climate scientists do) between surface-atmospheric warming and oceanic warming (the latter of which harbors 90%+ of the heat generated anyway). It is my understanding that if you net the two, then no, of course there was no “pause” or “hiatus”, because energy doesn’t just go missing. Rather, the heat simply moved around within the climate system. But if you take a look just at surface-atmospheric warming by itself, you do see a bit of a tapering off in the *rate* of warming since ~2000. Even with the Cowtan & Way kriging interpolation, you still have some slowdown (again, in terms of rate of increase) we need to account for. This has all been very adequately explained by processes that are already reasonably, if somewhat imperfectly, understood today, such as a cessation of ENSO which, by default, means that the climate system has been more characterized by La Nina phases since 1998; the PDO; Walker circulation which, driven by an increase in Atlantic ocean warming, turbocharged equatorial trade winds across the Pacific basin, pushing heat into the Pacific basin interior; and last but not least, a fair amount of volcanism that’s aerosol-loaded the stratosphere (though this seems to only account for a small fraction of the slowdown in surface warming). Of course, each of the above fall under internal variability and cancel each other out in the long run. They are the “dog’s tail” and not the “dog” (broader trend). So, as I understand it, there hasn’t been a slowdown in global warming, only a slowdown in the *rate* of surface warming. We should take care to distinguish between the two. More importantly, we can and have accounted for it, and will incorporate the knowledge we’ve gained of these processes into our GCMs going forward. You really *don’t* need to account for noise, which is what the alleged change in trend since 2000 is. If you make a practice of treating noise as signal, you make yourself vulnerable to making bad decisions. Maybe it would also be good to look at the strawman hypotheses that are implicit in the “no warming since [insert time here]” claims. In other words, the observations since [insert time here] contradict the claim that warming trend is above Y degrees C/year at a certain confidence level. For example, eyeballling it from looking at the top end of the bars your last graph on https://tamino.wordpress.com/2014/12/04/a-pause-or-not-a-pause-that-is-the-question/ , I might guess based on the data since since 2005, one can say the observed warming trend isn’t any more than 4C/century with 97.5% confidence. Or cherry-picking the 1998 bar: no more than 1.75C/century. That link is much reposted by a guy who’s, well, got a lot of time to make the rounds hyping his blog full of doubts. Looks interesting enough. I had wondered whether GRACE would allow you to tie down Steric sealevel rise to such a degree. GRACE data wouldn’t help with the steric component as the steric component is change of volume without change of mass. GRACE can only see changes in mass. If the mass is redistributed by density changes then GRACE might be able to spot it. If GRACE told you that there was some redistribution of water mass it would still leave you with the problem of attributing that redistribution of mass to steric effects or other causes (e.g. changes in wind forcing). I don’t think GRACE would be much help in tying down steric sea level rise. Note also that the paper linked to says that the deep ocean contribution isn’t detectable, rather than that it doesn’t exist. Or you could do residuals using GRACE to tease out stearic & non-stearic components of SLR. Yes, this has been done – there have been a number of papers in recent years comparing the sea level observations with the sum of mass change (GRACE) and steric estimates. The shortness of the time series and the size of the errors means that this is not terribly helpful. Going back to the comment that started this, GRACE data on its own doesn’t tell us anything about steric changes. My point was that GRACE helps you tie down the contribution to sealevel from iceloss/land water storage. That’s what models are for. The fundamental impetus of science is that observations by themselves are number gathering. They provide no meaning. To extract meaning you need a model. Models can be restricted or global. Global models tend to provide little detail, restricted models tend to tell you nothing outside of their limits. Models can be implemented in hardware, software or squishware. It is astounding that surface temperatures have warmed by seven tenths of a degree in the last 40 years. Given that forcings are continuing to increase rapidly, we can expect to see an acceleration in the rate of increase (all other things remaining equal). In 2013 forcings were 34% higher than in 1990. In 2014 they will be higher still. To answer the question posed by the title: yes. One key point is that one cannot test all possible starting points and combinations to look for a statistically significant combination. Clearly, if one found such a value, the p value would need to be far less than 0.05 to make it significant. Searching through large data sets to find a significant value is not a valid approach. Of course, Tamino’s point is that even if we take this approach, we still do not find a single 0.05 value. Yes, that’s the essence of the cherry-pick fallacy, isn’t it? Berkeley now have a land-ocean series, which might have been a better choice. Presumably the Cowtan & Way you’ve used is the krige dataset. The hybrid UAH, or even a hybrid of the krige and the hybrid, might have been a better choice. It’s interesting that RSS-TLT and UAH-TLT are so different, given that they use the same raw data to attempt to estimate the same thing. Troubling, in fact. I think it likely that RSS-TLT has developed an issue of some sort. Rate of change of jerk is, I believe, called jounce or snap. I have read that rollercoaster designers pay attention to this esoteric derivative for both safety and comfort. Jerk and jounce are both important in motion sickness (whether that is a positive or negative aspect of rollercoaster design, I’m not sure). I have also seen crackle and pop suggested as names for fifth and sixth order derivatives. The main post makes it easy to see why the recent (10 to 15 yr) trend isn’t statistically different from the 1970-to-present trend. (Nice visuals.) Would the exercise yield similar results if one were to fit a single linear trend to the temp data from, say, 1880 to present? Would the 1940-1970 period, or the 1970-2010 period, be statistically different from that 130 year linear trend? Thanks. Hank, Are you saying (suggesting ?) that anthropically generated aerosols are negligible relative to the past decade’s volcanism? All I know is that Schmidt, Santer, et al seem to agree that the climate models over predicted the warming because the models under-estimated negative forcing due to stratospheric aerosols. They seemed to agree that the aerosols were due to increased volcanism. I don’t know how much they considered anthropic aerosols. I’d be curious if anyone knows how much they thought about the question of volcanic (“natural”) vs anthropic aerosols. I don’t have time to research all the details on google scholar but I’d love to hear a synopsis. On second thought what does latitude have to do with it anyway? The US and China span similar latitudes. I don’t know what the latitudinal distribution of coal fired power plants is for the two countries but shooting from the hip it sounds like a small effect. Yes, that’s correct. You can look it up. Ohio and the UK were major sources early on; Four Corners is more recent; most of China’s and India’s are closer to the Equator. The photochemistry differs with latitude. Remember the first major use of coal, with no pollution controls and low stacks, was in Great Britan a century earlier. By the 1960s, the US was using tall stacks to dilute the pollution. All these make some difference — and the error bars are still quite large on all this. I’m not clear on how you have applied autocorrelation derived from monthly data to annual data. And, if you have applied autocorrelation that is broader than usual are you not masking the possibility for decade scale fluctuations to be detectable in the presence of uncorrelated inter-annual measurement noise? 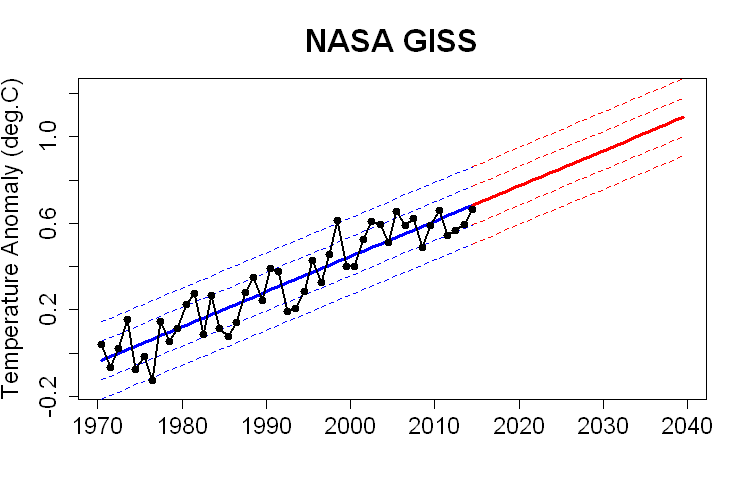 Surely the last green error bar here http://data.giss.nasa.gov/gistemp/graphs_v3/Fig.A2.gif suggests the measurements are becoming sensitive enough to say something about the reality of such wobbles. Back at the original post, I’ve applied reduced chi-square to see if a ramp plus plateau fits the GISTEMP data beginning in 1979 better than a ramp alone and that appears to be so. But, it does not bring reduced chi-square as close to unity as one might hope so there may be other structure as well. Finally, I wonder if your null hypothesis is well formed? Your trend determination (from 1970) is based in part on data which you then want to say is not different. That seems to have biased the test towards it not being different through that mixing since it won’t be different from itself. 1: A full tenth of a degree. 4. The full half degree decadal rise needed to get to the upper range limit in the 85 years remaining in this century ? The Shindell article is consistent with what I was saying in the first place, namely that all those coal fired power plants can give a short term negative forcing until the Chinese get tired of the pollution. The only information I found on the distribution of China’s coal plants doesn’t show a preponderance in the south. http://bittooth.blogspot.com/2012/09/ogpss-chinas-coal-industry.html There are a lot around the Shanghai-Nanjing-Kaifang region but there are plenty further north. I see nothing that indicates a significant difference in the Chinese latitudinal distribution as compared to the US one. It would be ironic if, as Hank’s comments suggest, the short-term result were to be increased warming. I’m not sure what Hank or you mean by “short term.” What I meant was that if the flattening is caused by “Chinese” aerosols then the temperatures will stay depressed until China stops generating them + however long it takes for the additional forcing to manifest. I would imagine that the manifestation time is at least a decade. I also think climate science can predict the temperature changes that will occur in response to various stratospheric aerosol trajectories “business & volcanism as usual” or something like that. This might be done to some political advantage. I’m not sure what I mean by ‘short term’ in this context, either! Far too many unknowns. China has deployed the world’s largest fleet of sulfur dioxide (SO(2)) scrubbers (flue gas desulfurization systems), and most of them now appear to be operating properly. Although many plant managers avoided using their SO(2) scrubbers in the past, recent evidence, based on a series of field interviews conducted by the author, suggests that managers of coal power plants now have incentives to operate their scrubbers properly…. Because SO(2) is the precursor of sulfate particles believed to cause significant cooling effects on climate, China’s SO(2) mitigation may make it more urgent to control the world’s greenhouse gas emissions. Note that that’s a 2011 study. So–just conceivably–Chinese sulfate aerosols and their global cooling effect have been decreasing–or maybe had a downward ‘step’ in the curve, interrupting a longer increasing trend as of a couple of years ago. 2010 was the world’s warmest year in a couple of the major databases–till 2014, apparently. Coincidence? Well, yeah, it sure could be. But maybe not, too–just maybe! Makes you wonder if there are reliable observations of planetary albedo over the last decade. Comparisons to the early years of coal burning in England and the US aren’t easily made. Hank, yes more data points on that sea ice post. Check out the Cryosphere Today site. Since 2012, arctic sea ice has increased back up to the long term declining trend line. Antarctic sea ice has had a positive anomaly continually since that 2012 post and has set all time extent records. Global sea ice has averaged positive anomalies for the past two years. See Eric’s new post over at RC for a discussion on Antarctic sea ice. Been much-discussed over at RC recently. As expected, the watties that showed up failed to grasp that the increase in *global* sea ice did not mean what they thought it did. Today is December 21st. The first day of Winter. However, by May, temperatures will quite higher on average. Therefore, I declare that in May there will be “pause” to winter which disproves this whole “seasons” nonsense. Connotative Linguistics are a hoot. The Older and Younger Dryas were actual ‘pauses’ and ‘hiatuses’ during the thawing out of the Wisconsinan Ice Age. Yet despite these pauses, here we are. Jim Eager: Thanks for pointing me over to RC regarding the Antarctic sea ice. That discussion did indeed clarify the true mechanisms behind the recent ice formation down south. You are correct, the large ice extent did not mean what I thought it did. I mistakenly believed the increase in ice formation resulted from some combination of colder sea water and air. It turns out, however, that changing/increasing winds push the ice away from the pole into warmer water that would otherwise not support ice formation. And here is the thing, rather than that ice melting in the warm water, the open water between the ice actually freezes, creating a larger ice sheet. Further, these areas of open water do not occur near the leading edge of the ice in warm water, they only occur near land in previously frozen areas where air and water are cold enough to re-freeze the open water. I have already embarrassed myself once here by not seeing what is obvious to others, but I have another question. Being on the southern bottom of a sphere, as the ice gets pushed up north it occupies an increasing area for each northerly incremental increase in extent. Physically, this would have to break up the ice exposing warm water that cannot freeze because it is too warm. The RC explanation makes sense closer to land but not in the warmer water. What am I missing here?